There are many Buddhist temples in Tokyo. Visiting them reveals the city in a new light! On the grounds of the Kongo-in temple is a sacred place called Osunafumi. 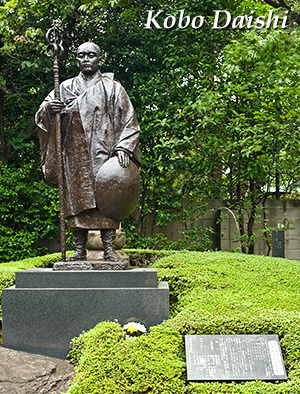 Around a statue of the founder of Shingon Buddhism, Kobo Daishi (Kukai; 774–835), dressed as a monk in training, stand four square-section posts. At the bases of these posts, sand (osuna) is spread from the eighty-eight pilgrimage temple sites on the island of Shikoku associated with Kobo Daishi. It is said that walking around the Osunafumi one million times imparts miraculous virtues. Visitors to Buddhist temples are entitled to receive vermillion stamped seals. Though they may serve as remembrances, the seals actually indicate reception of the benevolence of the Buddha. Essentially they are verification of the presentation to the temple of sutra transcriptions and must never be regarded as mere souvenirs. Visiting a temple intensifies faith in the constant companionship (Dogyoninin) of Kobo Daishi and is training in self-knowledge. It should be accompanied by chanting Namu Daishi Henjo Kongo (Kobo Daishi ni Osugari Shimasu), an assertion of reliance on Kobo Daishi. This kind of Buddhist practice is available to everyone. Such pilgrimages should include visits to all the temple halls, including the Main Hall and the Daishi-do Hall, or Hall of the Great Teacher! 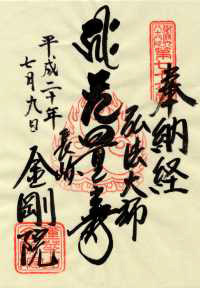 Payment of a prescribed fee (300 yen) for reception of a donated transcribed sutra includes a transcribed-sutra booklet in which to receive a vermillion seal signifying submission of a transcribed sutra.